Bornholm is a tiny fishing port located 200km east of Copenhagen. It is officially the sunniest part of Denmark, blessed with picturesque streets, sandy beaches and glorious food. After our visit to the Baltic Sea Glass and Round Church, we travelled back to the town center where we were treated to a sampling of smoked mackerel before returning to our ship. 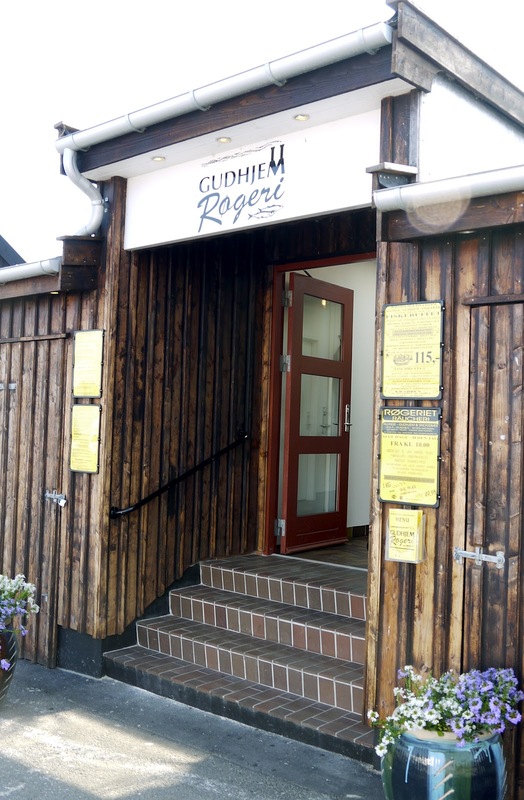 Built in 1910, Gudhjem Rogeri is the oldest smokery in Bornholm. Here you will find herrings hanging over an open alder wood fire, smoked for a good three to four hours. The golden smoked herring was served with rye bread, chopped radish, onions and chives, along with some coarse salt and butter. The texture of the herring was firm and crisp, packed with smokey and delicate flavors. We concluded that the herrings were well worth sinking our teeth into, despite all the tiny fish bones that occasionally find its way into our mouth. Address: Ejnar Mikkelsensvej 9, Gudhjem, Bornholm 3760, Denmark. the fish must be berry crispy! The herring cooked to perfection and that looks very appetizing. The herring really looks like it has skin made of gold paper! Their kitchen looks .... cooling. That's a gorgeous looking herring. Very delicate too! The fish look dry, does it?